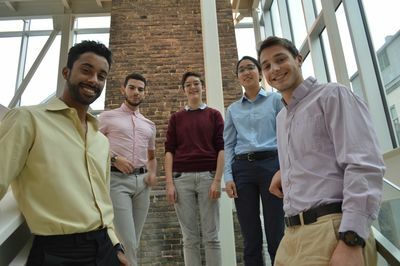 Queer Engineer is an EUS club at McGill University that strives to provide a safe and welcoming environment for gender and sexual minorities, within both the Faculty of Engineering and McGill as whole. QE welcomes all gay, lesbian, bisexual, asexual, trans, queer and allied students, and students with a variety of sexual and/or gender identities outside of those labels. To achieve this goal, Queer Engineer holds events throughout the year designed to help students and their friends learn about possibilities in engineering, meet new people, and have fun. Queer Engineer also informs its members about other events going on in the community. To learn more about QE, the events they host through the semester, and how to get involved, visit the QE Facebook page or email at queer.engineer@mcgilleus.ca. Every winter semester, Queer Engineer hosts our largest event: the networking event. We invite LGBTQ+ professionals from all types of engineering backgrounds to share their experiences about being queer in an engineering workplace. This evening is not only a great way to learn about the engineering profession, but also a great opportunity to meet a diverse set of individuals. Like all our events, it is open to everyone who has an interest in learning more about engineering or the LGBTQ+ Community. Throughout the year, we host a multitude of different activities and socials to help bring the engineering and LGBTQ+ community together. This includes collaborations with other McGill groups, such as Queer McGill, and also external groups such as QueerTech and other universities. Events are hosted about once a week. Some of our events include skating, dancing, "gaymes" nights, going to the gay village, socials and many more. Right before exams in the fall and winter semester, we host a study party for all those who are interested. We reserve the McConnell Engineering Common Room and provide a quiet and comfortable space for students to prepare for their exams. We also provide food and drinks. Queer Engineer was founded in 2010 by Josh Redel. This page was last edited on 9 January 2019, at 13:55.